Site Work in Mississippi and Alabama! 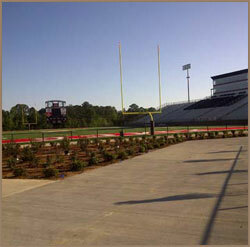 We perform full Jackson grading and paving services regardless of the extent of the construction work. For instance, we can provide patchwork on relatively asphalt surfaces or provide full-fledged grading site work and sewer line repairs if needed throughout Mississippi and Alabama. The underground utility services we provide include storm drainage, rock and/or auger boring, water distribution, tunnelling, and gas distribution. All of our contractors are fully insured, bonded, and licensed professionals that have undergone extensive training in performing partial and full Jackson underground storm draining services for various purposes, including flushing out mosquito infestations. As a full service landscaping and site work construction enterprise, we are also State Licensed in Mississippi and Alabama to perform cleaning, grubbing, and snagging work for the residential and industrial sectors. We perform several different types of demolition site work in Mississippi and Alabama depending on the structure at hand, including mechanical and manual demolitions, as well as deconstruction, undermining, and implosions. We design, construct, and install building pads on various different types of terrains and environments in order to lower or raise the topography, depending on the elevation required to perform filling or cutting work. Construction Plus LLC also performs full drainage services for our Mississippi and Alabama site design projects upon request.